My 55 year old bones have asked me to try putting a sus fork on my 2014 Kona Unit. I intend to buy one online and have my LBS install it, as I am mechanically inept. The price is right, looks good to this noob. Spec-wise does this Reba look like a good choice? My Unit is stock except I have a 2.4 Ardent upfront. Why not just buy it from your shop instead? I would, but I have Jenson gift dollars I need to spend! You may also need to get a different headset. I can't remember if the '14 unit has a tapered steel fork AND 44mm head tube or not. That is a decent fork to go with, alternately if you decide to stay rigid you could consider a carbon or ti handlebar to dampen some of the harshness. Ahhh--Jenson only has that Reba tapered, and Kona customer support says I need 1 1/8". Need to make sure the fork axle is compatible with the wheel you intend to use. Dunno if the stock front wheel on the Unit can be converted to thru axle or not. They said I would need to "re-lace my rim to a 15mm hub". That would suggest the stock wheel can be modified, yes? No, it would have to be dismantled and rebuilt around a new hub. I am not sure I follow what customer service is telling you on this. If the headtube is 44mm wouldn't it be easier/cheaper to replace the headset (or possibly just the lower cup?) and run the tapered fork than to rebuild the wheel for the non-tapered one? Switching hubs solves the problem. Some hubs let you change axles by just switching end caps but not the stock wheel on the Unit since Kona says you need a different hub. He was advising me to go to a thru axle if I add a sus fork to the Unit. I've been doing some reading and it seems a TA is ultimately preferable, stiffer, better performance. Is that correct? Would I likely save money with the cheaper tapered QR fork with a new headset as opposed to the other option(rebuilding the wheel, new hub, etc. for the TA fork) Would I notice a performance/feel difference between QR and TA? What about safety/durability? Performance-wise the new hub and thru axle fork wins. Money-wise the lower headset cup and QR fork wins. You could probably tell a difference between the QR and thru axle forks, but whether it's a big enough difference to matter to you likely depends on your terrain and how you ride. Safety and durability differences probably aren't something to be very concerned about. With an external lower headset cup, you can use a tapered fork. My LBS told me if I need to replace the spokes in order to mod the existing wheel to the new hub, it could be around $50 each! I could get a new wheel for cheaper than that, no? Either of those scenarios is starting to get WAY out of budget for me. I'm trying to stay under a grand, like, close to $800 if possible…. EDIT: I MUST have misunderstood him--surely he must've meant a spoke cost of $50 each for each wheel…. This gets you there fairly inexpensively. You can also buy a tapered and TA fork and change the front wheel (or both wheels, selling your actual ones). If you want to stay low on money, I would follow the suggestion of Geralt. I pulled the trigger on this configuration--had almost enough Jenson bucks to cover the whole thing. This way I can try out squish on this bike for little outlay. I expect I'll go back to rigid at some point, but rocky SoCal has been beating me up of late! Well, plans changed---I ended up going to my LBS with the bike and going over my options, and ended up having them order me a Recon Gold TK Solo Air - straight 1 1/8", QR. The price was good, and this will facilitate easier switching back and forth between the Recon and the stock P2 should I want to do that. Good, but let me tell you, if you had used an adapter tapered->1 1/8 for the P2 fork, you could have swapped between tapered suspension and straight rigid in the same simple way (just take one out and plug one in). Quick question---considering how the P2 has that slight rake to it, this new fork will potentially make it less slack in front, making me feel a wee bit more forward in the cockpit, is that right? I am not sure what you mean but, the sus fork will slack your head tube angle and increase your wheelbase. You should feel more backwards. Does it make sense? Ah--yes, that makes sense. It's pushing the front end up a bit, essentially tipping the bike up/back, creating more of an angle, correct? Suspension forks have rake, too. It's just designed in in a different way, and the MTB community calls it offset. Thanks--interesting. Reading up on all this stuff now, trying to get my head around it! Looking forward to seeing how it feels AND fits with the new fork. Well, here she is post-face-lift with a new RockShox Recon Gold TK, with a remote lockout. Only one short ride so far, on the usual rough and rocky terrain around here, and this is indeed an improvement in comfort, especially on the descent. I never quite understood when you guys talk about slackness. Based on the above thread, the handlebars would rise up and one would feel more backward vs weight fwd on the bars, is this right? And is it true that 120 is too much squish for the Units geo? Living in FL now, may move to NC. I never quite understood when you guys talk about slackness. Based on the above thread, the handlebars would rise up and one would feel more backward vs weight fwd on the bars, is this right? Yep. Typically you want to simultaneously lower your bars and move your saddle forward to compensate. Your cockpit will be shortened (despite your bike's wheelbase growing). It might work for some, but I think its not the greatest idea. It's not too much squish as much as it too much fork length. Older Units like mine had a fairly steep headtube angle (not slack), but the bottom bracket height (BBH) was tall (and only made taller with a 120mm fork). Kona has, over the last 4-6 years, gradually lowered the BBH while slackened the headtube angle, so now, for '16, the headtube is relatively slack with the stock rigid fork. Anyhow, what I'm trying to get at, is it seems to me that no matter what year Unit you have, a 120mm fork will jack up your geometry, whether it makes your BBH too tall, or your headtube too slack. YMMV. My 19 feel a touch small on me, would not changing the bars or seat and adding a 100mm fork help open up the cockpit? Hard to say. Depends on a lot of factors. Wider bars might help a bit, or possibly higher grips (whether through a riser bar, headset spacers, or riser stem). But my best guess is no. Personally, I like a rigid SS to be on the small side, and use a lot of body English. Once suspension is introduced (and faster speeds), I like a longer bike, shorter stem, slacker head tube angle, and use less body English. Saddle position should be pretty consistent regardless of what you do. Moving the saddle to get a better fit on an ill-fitting bike is not a solution. Set the saddle position correctly, then adjust your bars/stem. 2014 Big Unit seat post and clamp size?????? 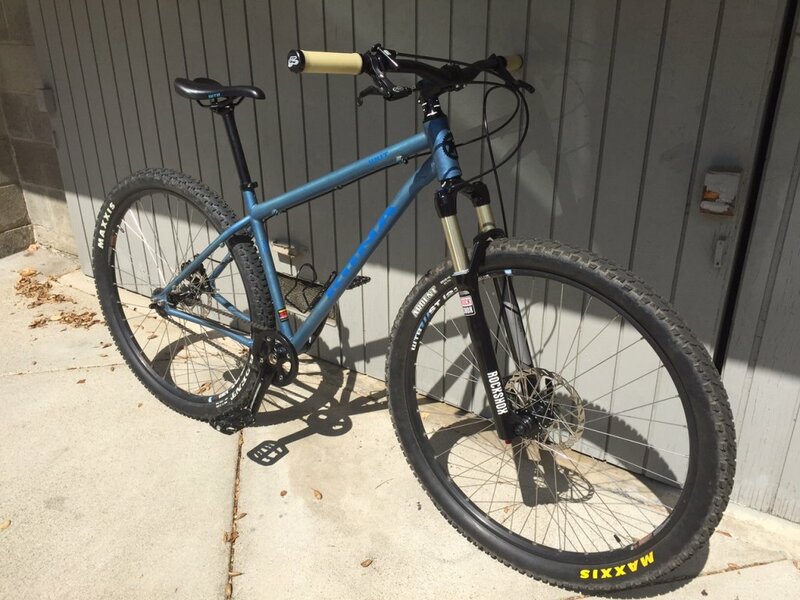 2013 Surly Karate Monkey or 2014 Kona Unit for a Clyde?